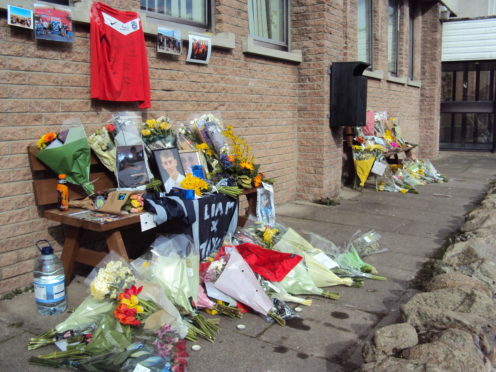 Flowers were piled up in tribute to Liam Smith. 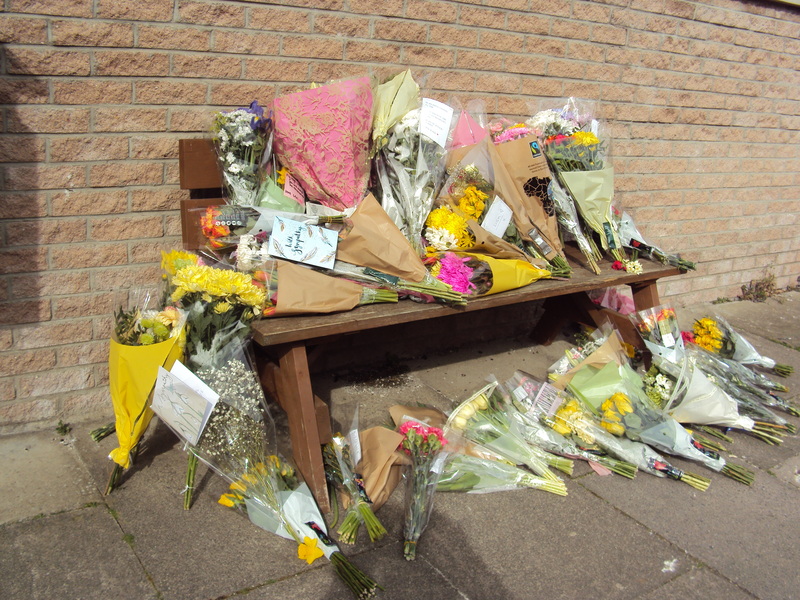 Floral tributes were piled high outside the school of tragic Liam Smith yesterday as his devastated family said their “hearts are broken” over his death. The 16-year-old’s body was found in a remote woodland on Friday, four months after he went missing. His mother, Alix Smith, said the family were struggling to come to terms with their “enormous loss” as she thanked all those who had helped in the search. She said: “While we never gave up hope of finding Liam, we were realistic about the challenges facing us. “We would like to take this opportunity to thank everyone who has been involved in the search for Liam, including members of the public who took it upon themselves to help. At Westhill Academy yesterday, classmates of the “well-known and widely-liked” teenage left flowers, photographs and cards in the playground, along with a signed school football shirt. 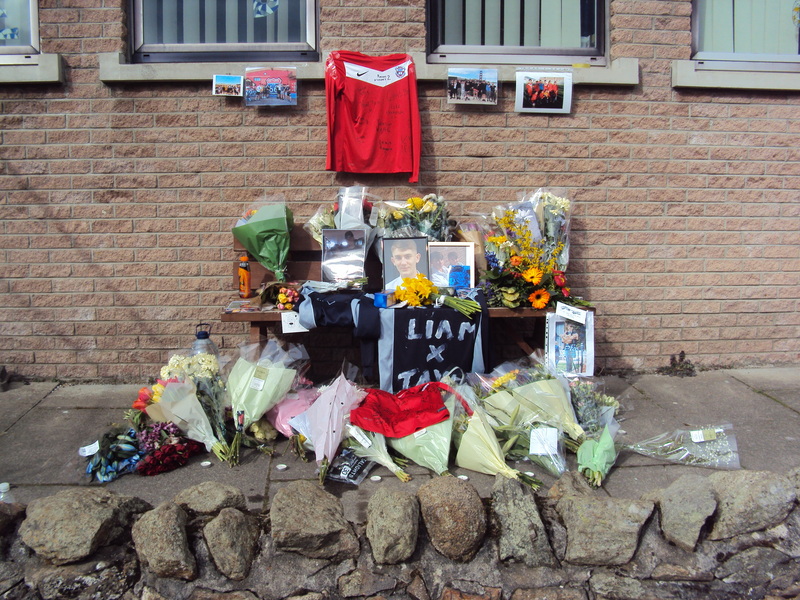 It is understood the touching tributes were left in a spot were Liam liked to socialise with his friends on breaks. Head teacher Alison Reid said: “The Westhill Academy community is very close-knit. “The confirmation of the death of Liam Smith has hit the school hard, and pupils and staff are coming to terms with what they have heard. “Liam was a well-known and widely-liked pupil, and we will all miss him deeply. “We are working with our chaplaincy service, our educational psychology team and our own internal support networks to help pupils process this sad news. Laurence Findlay, director of education at Aberdeenshire Council, added: “The pupils and staff at Westhill have shown immense courage, but we recognise that it will take time to process and come to terms with this news. Liam disappeared on November 17 last year, after getting on a bus to Banchory at Aberdeen Bus Station. CCTV was not working on the bus, but a passenger reported that Liam had got off in the Crathes area – prompting officers to focus their massive search operation in that area. The search was officially scaled down last month after police helicopters, divers and sniffer dogs failed to find any trace of him. On Friday, a walker found his body in the woods at Craig of Affrusk, south of Banchory – seven miles away from Crathes, and on the other side of the River Dee. It is understood the location of Liam’s body was in a hard to reach part of the forest, which isn’t commonly used by walkers. The teenager’s disappearance captured the hearts of thousands of concerned people across Scotland and beyond. Alex McLeish, the manager of Scotland’s national football team was among many who appealed to the public to help police find Liam, who was a passionate football fan.